Mission Free Iran’s campaign, “IRI Out of ILO” (Islamic Republic of Iran Out of the International Labor Union), is an important element of our work. The Islamic Republic has virtually enslaved much of the wage labor force, in some case not paying workers their wages for more than a year. As part of our IRI Out of ILO campaign, we are promoting the Free Them Now! campaign, presented here, in an effort to bring greater attention to the routine suppression and brutal abuse of workers and their families in Iran. In Iran, workers are routinely arrested for going on strike, for building a union, or for celebrating May Day. That is what happened to bus workers in Tehran: Over 700 of them were arrested when they went on strike in 2006. Some of their leaders, such as Mansoor Ossanlou, are still in jail, and some have been fired from their jobs. It happened to sugar cane workers when they organised protests over unpaid wages and built a union. Their leaders have spent months in prison and are daily harassed with court summons and heavy bails. Some have also lost their jobs. Teachers who took strike action and held rallies over their pay and conditions have also been put in prison. Over the years, hundreds of workers have met a similar end for exercising their fundamental right to freely organise, strike and assemble. Arbitrary arrests and detentions, long prison terms, violent interrogations, beatings, even use of lashing to degrade and break down, denial of medical care to sick detainees, constant harassment in the form of court summons, heavy bails and daily threats issued against the workers and their families, and the ultimate weapon of cutting workers off their livelihood by firing them, make up a brutal regime of systematic persecution of labour activists in Iran. 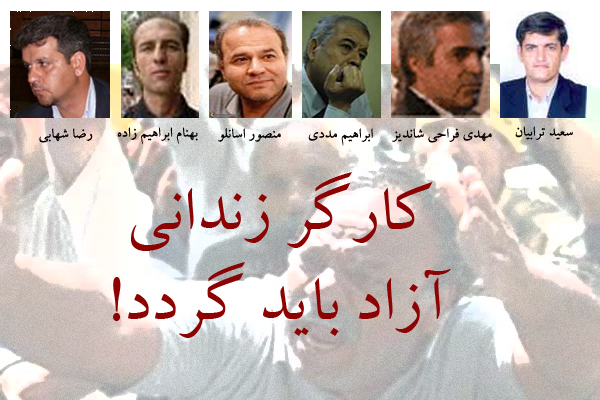 In May this year, the regime added to its 31-year record of horrific human rights abuses by executing well-known teacher and labour activist Farzad Kamangar, along with four other political prisoners. The world’s trade unions and human rights organisations had been campaigning for Farzad’s release for years, and vehemently condemned the callous killings. We, a group of labour activists and campaigners from Iran and around the world, have set up this campaign to highlight the plight of the workers currently in jail in Iran or under the threat of arrest and detention. The aim of the campaign is the immediate and unconditional release of all labour activists who are currently in jail. Some of us are former members of the very unions suppressed by the regime in Iran, who are continuing the fight in exile through this and other campaigns. Our demand is clear: the terror and violence against workers in Iran must stop! Workers in Iran should be able to freely exercise their fundamental right to set up their own organisations, meet, assemble and protest as they wish, take strike action, organise and take part in rallies, etc., without fear of being arrested and thrown in jail. All jailed workers must be immediately and unconditionally freed! * Another teacher, Abdolreza Ghanbari, was arrested during the mass anti-government demonstration on 27 December 2009. He has been sentenced to death. We call on all trade unions and human rights organisations around the world and all individuals and organisations appalled by the horrific human rights abuse in Iran to support and sign up to this campaign. فشار بر روی فعالین و رهبران کارگری شدت یافته است. جمهوری اسلامی در تلاش برای بقاء فعالین و رهبران کارگری را زیر فشار قرار میدهد و دستگیر و زندانی میکند تا سازمانیابی و رهبری مبارزات کارگری را سد کند. مراکز کارگری از اعتراض و مبارزه حالتی انفجاری بخود گرفته است و جمهوری اسلامی میداند که جلوی صحنه آمدن کارگران با قدرت تشکل و اعتصابشان یعنی چه، میداند که روی دادن این اتفاق در دل شرایط پر تب و تاب جامعه چگونه تکلیف اوضاع را یکسره خواهد کرد. از اینرو بر فشارش بر فعالین کارگری شدت داده است. در همین ماه سعید ترابیان و رضا شهابی از رهبران شناخته شرکت واحد دستگیر شدند و هم اکنون در بند ٢٠٩ اوین بسر میبرند و جمهوری اسلامی مانع ملاقات خانواده هایشان با این کارگران و درز هر گونه خبر از آنان به بيرون از زندان میشود. در ١٩ و ٢٢ خرداد ماه بهنام ابراهیم زاده و مهدی فراخی شاندیز از فعالین کارگری دستگیر شدند. بر روی این کارگران آنچنان فشاریست که قفسه سینه بهنام ابراهیم زاده آسیب دیده و پای او شکسته است. اين در حاليست كه منصور اسانلو و ابراهيم مددي دو تن ديگر از رهبران سرشناس شركت واحد از قبل در زندان جمهوري اسلامي بسر ميبرند. و در هفته های اخیر خبرهایی از فشار بر خانواده و وابستگان منصور اسانلو بود. همچنین تعدادي از معلمان به اسامي عبدالرضاقنبري (که به اعدام محکوم شده است )، سيد هاشم خواستار، رسول بداقي، عبدالله مؤمني، محمود بهشتي لنگرودي، علي اکبر باغاني، محمد داوري، عليرضا هاشمي،حسين باستاني نژاد و قربان احمدي دستگير و زنداني شده اند. ما امضا کنندگان زیر با اعلام کمپین برای آزادی کارگران زندانی همگان را دعوت میکنیم که در داخل و خارج از کشور وسعیا به این کمپین بپیوندند. همه مراکز کارگری و همه تشکلهایی که به همت خود کارگران تشکیل شده اند و اتحادیه های کارگری در سراسر جهان و حمایت وسیع مردم، نیروی عظیم این کمپین هستند. ما همه کارگران، معلمان، دانشجویان و همه بخش های جامعه و تمامی ایرانیان خارج از کشور را فرامیخوانیم که در اشکال مختلف، با طومارهای اعتراضی خود، با شركت در تجمعات اعتراضي خانواده هاي كارگران زنداني، با حمایت از خانواده هایی که عزیزانشان در زندان اند، با مطرح کردن مساله کارگران زندانی در رسانه های مختلف و با مبارزات متحد خود كارزار قدرتمندي را براي آزادي كارگران زنداني بر پا داریم. ما در اطلاعیه ای جداگانه جهانیان را به حمایت از این کمپین فراخوانده و تلاش داریم تا صدای اعتراض کارگران ایران در سطح بین المللی باشیم و وسیعا افکار عمومی را به پشتیبانی از این کمپین فرابخوانیم. کمپین براي آزادي كارگران زنداني تا آزادی همه کارگران زندانی ادامه دارد و آنرا گام مهمی در باز کردن درب زندانها و آزادی همه زندانیان سیاسی و عزیزان در بندمان میدانیم. به هر شکل که میتوانید به این کمپین کمک کنید و خود را فعال این کمپین بدانید. كارگران زنداني و همه زندانيان سياسي بايد فورا از زندان آزاد شوند! ديو بيلكيني: مسئول بخش آموزش اتحاديه كارگران پست كانادا.